Consignment. 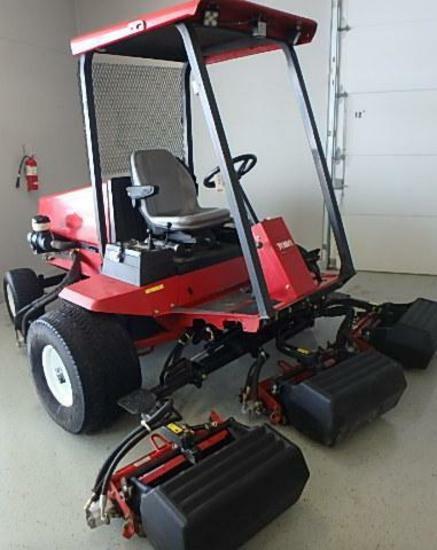 Golf Course & Landscape & Light Construction Equipment, Commercial Lawn Care Equipment, Utility Vehicles, Skid Loaders & Attachments, Trenchers, Consumer Mowers, Trucks & Trailers. Payment Instructions: Payment is required within 48 hours of conclusion of auction and can be made at the time of scheduled pick up. Checks must be made payable to Fahey Sales Auctioneers & Appraisers. 10% buyers premium applies to payments by cash, check or wire transfer, 12% buyers premium applies to Visa, MasterCard, and Discover. (a 20.00 fee applies to wire transfers). A buyers premium cap of $1,500 per item will apply. Items not paid for within the required time will be charged to your credit card on file with proxibid. Adjustments in sales tax (if applicable) may be made at the time of payment. Additional excise tax and transfer fees apply to lots requiring registration. ***** IMPORTANT PLEASE READ ************************************* If sending a Freight Company or third party to pick up your purchases, a bill of lading MUST be emailed to sold@faheysales.com or MUST accompany the driver at the time of pick up. Fahey Sales Agency MUST NOT be listed as the shipper. The BOL must also mention the purchaser as well as the items they are authorized to pick up. Items will not be loaded and BOL will not be signed if our company is listed as the shipper. NO EXCEPTIONS. Preview Date & Times: Monday - Friday from 8 a.m. to 5 p.m.
Driving Directions: 2910 9th Street East (Hwy 212 East), Glencoe, MN, 55336. Approximately 35 miles West of I-494 on US Hwy 212. PLEASE VIEW ALL INFORMATION PRIOR TO BIDDING. ***** All property is sold AS IS, and ALL SALES ARE FINAL. Property is open to thorough public inspection. It is the Bidder?s responsibility to determine condition, age, genuineness, value or any other determinative factor. Fahey Sales Agency may attempt to describe the merchandise in advertising, on the internet and at the auction but makes no representations. In no event shall Fahey Sales Agency be held responsible for having made or implied any warranty of merchantability or fitness for a particular purpose. Bidder shall be the sole judge of value. Bidders who bid from off site and are not present at the live auction or preview understand and acknowledge that they may not be able to inspect an item as well as if they examined it in person. It is the Bidder?s responsibility to determine condition, age, genuineness, value or any other determinative factor. Fahey Sales Agency shall endeavor to describe in detail each item and any pertinent information about it. Fahey Sales Agency will not be responsible for any errors or omissions in the description of the merchandise. Bidder agrees that everything is sold as is and that they may not return any item they purchase. Fahey Sales Agency is providing internet pre-auction and live bidding as a service to Bidder. Bidder acknowledges and understands that this service may or may not function correctly the day of the auction. Under no circumstances shall Bidder have any kind of claim against Fahey Sales Agency or anyone else if the internet service fails to work correctly before or during the live auction. Fahey Sales Agency will not be responsible for any missed bids from any source. Internet bidders who desire to make certain their bid is acknowledged should use the proxy-bidding feature and leave their maximum bid 24 hours before the auction begins. Fahey Sales Agency reserves the right to withdraw or re-catalog items in this auction. All items are subject to prior sale. Some items may sell subject to seller confirmation. The reserve may drive the bidding on some items. This is not an absolute auction unless specifically stated in the auction heading. You've been outbid to R****9! to YOU! You've been outbid to s****v! to YOU! You've been outbid to r****7! to YOU! articulating, all wheel drive, seller states: stored inside year around, well maintained, no mechanical issues. You've been outbid to C****a! to YOU! You've been outbid to I****g! to YOU! You've been outbid to B****t! to YOU! You've been outbid to o****e! to YOU!